A 2 year old boy presenting with tachypnea and dyspnea was diagnosed with anomalous supply of the left lower lobe on CT Scan. Chest CT was suggestive of an Arterio-venous malformation at the lower left lobe and a patent bronchus supply. The operative findings were of a large anomalous vessel originating from the descending thoracic aorta and supplying the lower left lobe of the lung, in addition to the left pulmonary artery branch with multiple large collateral veins converging on the inferior pulmonary vein. The post-operative period was uneventful. Systemic supply of a lung lobe in the absence of sequestration is a rare congenital malformation on the lung sequestration spectrum. Isolated tachypnea is an unusual presentation of this condition, with hemoptysis being the most common symptom. Anomalous systemic supply, Lobectomy, Tachypnea, CT scanning. This case highlights the fact that despite the rarity of the condition and its variable presentation, one must always keep this in mind when faced with tachypnea of unknown origin, particularly in an institution with limited access to more advanced medical facilities. A 2 month old boy with a history of tachypnea and dyspnea since the neonatal period was admitted for recurrent urinary tract infections and suspected pneumonia. The mother reported tachpnea, nasal congestion, poor feeding and frequent UTIs. He had an uncomplicated birth and pre-natal period, No know family history and attained all developmental milestones. Persistence of the dyspnea and tachypnea after antibiotic treatment as well as failure to thrive led to a suspected diagnosis of interstitial pneumonitis or congenital heart disease. Chest Radiograph showed hyperinflation and bibasal consolidation with normal cardiac margins. Echocardiography showed normal cardiac function. 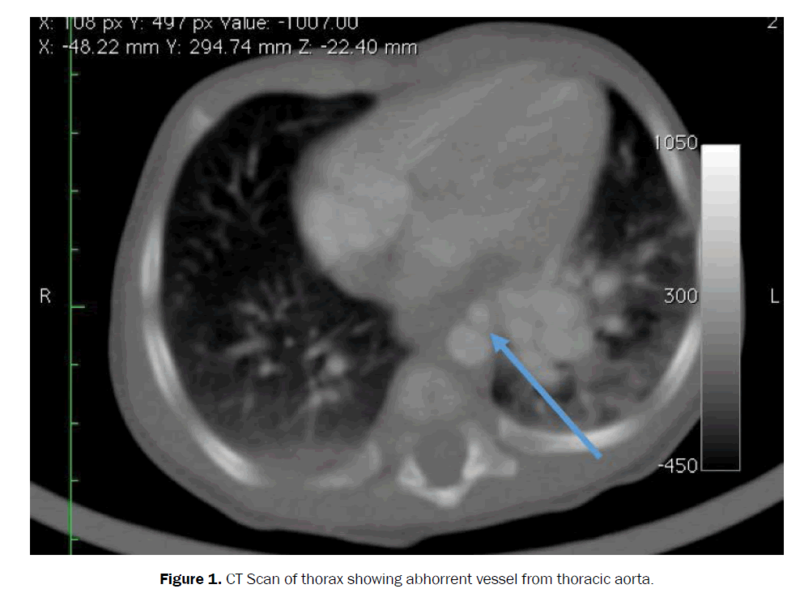 Chest CT was suggestive of an Arterio-venous malformation at the lower left lobe and a patent bronchus supply (Figure 1). Figure 1. CT Scan of thorax showing abhorrent vessel from thoracic aorta. Due to the symptomatic nature of the patient and to prevent pulmonary hypertension and future heart failure, a left lower lobectomy and ligation of the vessels (Figure 2) including the bronchus was undertaken. Figure 2. Ligation of anomalous vessel. The operative findings were of a large anomalous vessel originating from the descending thoracic aorta and supplying the lower left lobe of the lung, in addition to the left pulmonary artery branch with multiple large collateral veins converging on the inferior pulmonary vein. The post-operative period was uneventful. Predominantly found in people of east Asian descent, anomalous systemic supply to the lung without sequestration has an estimated prevalence of 8.3-35% . It most commonly presents with hemoptysis as the major symptom. Sequestration describes the absence of a patent bronchus supplying oxygen to the alveoli. Anomalous systemic supply of an otherwise normal lobe of the lung can be described as being on the ‘sequestration spectrum’ described by Sade et al. and is one of the rarest conditions on the spectrum  the aberrant vessel most commonly arises from the thoracic descending aorta. Cases have also been reported of the arterial branch coming from the abdominal aorta, or less frequently, the coeliac plexus. Multidetector CT scanning has replaced angiography in diagnosis due to its greater accuracy of diagnosis . Lobectomy is the most common form of management for this condition. Some cases are amenable to embolisation of the anomalous artery with normal pulmonary arterial supply and no existing parenchymal damage. The surgical procedure of lobectomy, or arterial ligation has been shown to be feasibly performed thoracoscopically, reducing the morbidity of a lateral thoracotomy . Systemic supply of a lung lobe in the absence of sequestration is a rare congenital malformation on the lung sequestration spectrum. Isolated tachypnea is an unusual presentation of this condition. Cauldwell EW and Siekert RG. The bronchial arteries; an anatomic study of 150 human cadavers. Surg Gynaecol Obstet. 1948; 86:395-412. Sade RM, et al. The spectrum of pulmonary sequestration. Ann Thorac Surg. 1974;18:644-658. Brühlmann W, et al. Therapeutic embolization of a systemic arterialization of lung without sequestration. Eur Radiol. 1998;8:355-358. Lee EY, et al. Evaluation of angioarchitecture of pulmonary sequestration in pediatric patients using 3D MDCT angiography. AJR Am J Roentgenol. 2004;183:183-188. Mori S, et al. Anomalous systemic arterial supply to the Basal segments of the lung: feasible thoracoscopic surgery. Ann Thorac Surg. 2013;96:990-994.